Sponsored by Stackpole & Assoc. "The Future of Healthcare: Global Trends Worth Watching"
February 13-15, 2012 – San Antonio, Texas, U.S.A.
Dr. Johnson is the author of the recent book: The Future of Healthcare- Global Trends Worth Watching and is the Principle Investigator (PI) for the U.S. Department of Commerce’s $500,000 grant to explore U.S. inbound medical travel. 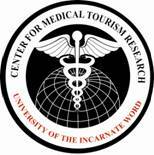 The CMTR will be holding the 3rd Annual Medical Tourism Research Conference in San Antonio, Texas, U.S.A. on February 13th to 15th, 2012. The CMTR examines business, clinical, economic, ethical, legal, marketing, operational, policy, social justice, and societal impacts of the Medical Tourism, Medical Travel, Dental Tourism, Health Tourism, Fertility Tourism, Transplant Tourism, and Retirement Tourism industries worldwide. The conference is open to all interested stakeholders in this emerging global industry.